PEMBROKE, Bermuda--(BUSINESS WIRE)--Jun. 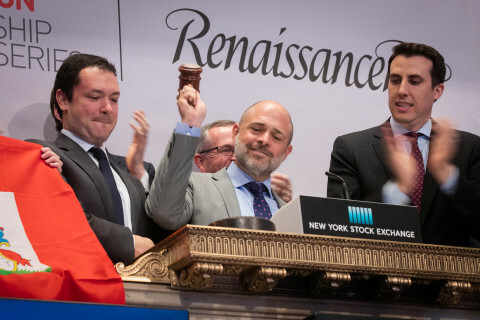 3, 2016-- RenaissanceRe Holdings Ltd. (NYSE:RNR) rang the closing bell of the New York Stock Exchange on Thursday, June 2nd. This year RenaissanceRe is celebrating its twentieth year as an NYSE-listed company, as the company’s common shares began trading on the New York Stock Exchange under the symbol "RNR" on July 24, 1996. On the afternoon of June 2nd, RenaissanceRe also convened nearly 200 leading policy makers, insurance industry experts, scientists, environmentalists, and members of the media at the New York Stock Exchange to discuss the recovery of lower Manhattan and lessons learned since Superstorm Sandy at the “New York Recovery & Resilience Leadership Forum.” The Forum was conducted through RenaissanceRe’s Risk Sciences Foundation, which it created to support advanced scientific research in atmospheric risks, the development of risk mitigation techniques to safeguard communities, efforts that reduce the economic turmoil following disasters, and organizations that promote physical and financial resiliency.